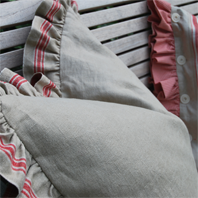 For lovers of original and historical linen fabrics, "Mrs. Fairfax"
home and add something wonderful to your lifestyle. „Our exclusive pillows, plaids and bags are brought to you in the style you know – handmade and with a pinch of love, with an attention to detail. Our refinement of the historical fabrics stretches from frill fronts and bows, vertical and horizontal inverted pleats to sophisticated piping.